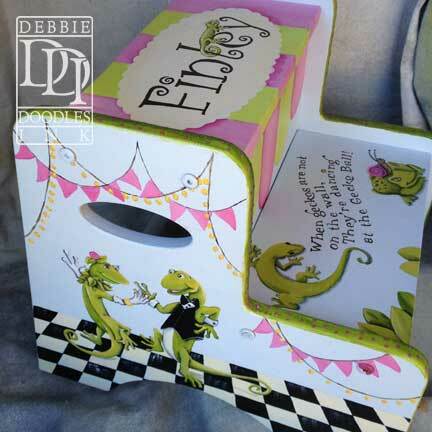 Creating fanciful Step Stools is one of my many passions. a name, color or idea for a theme and nothing more. This process has been fun and exciting. as much as I have enjoyed making them. That’s not all I did this week. Next post . 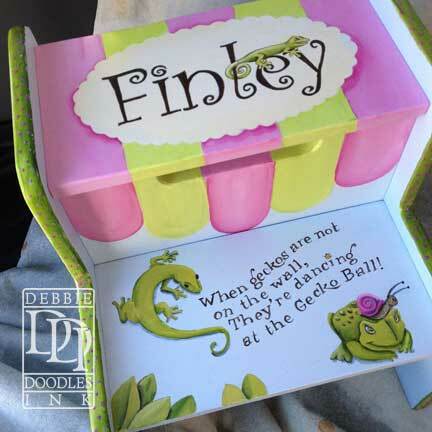 . .
Gallery | This entry was posted in Gifts, Hand Painted Furniture, Illustration, Step Stools and tagged Birthday Gifts, Children's Furniture, Geckos, Gifts, Hand Painted Step Stools, Hand-Painted Furniture, Shower Gifts, Step Stools. Bookmark the permalink. That stepstool turned out really cute! Thanks Mary, it was a lot of fun to do. I had so much going on the day I delivered it though and it had been raining and cloudy for days. The only photos I got were taken in the back of my car right before I delivered it.